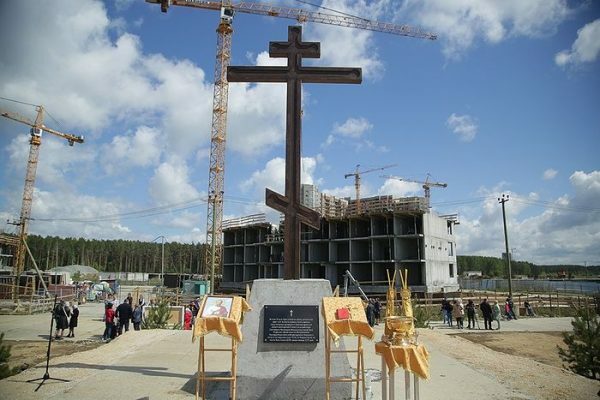 Moscow, June 19, Interfax – Metropolitan Kirill of Yekaterinburg and Verkhoturye conducted the rite of consecrating the cross at the building site of the church dedicated to the righteous passion-bearer Eugeny (Botkin, doctor of Nicholas II’s family) and all doctors of our Motherland, the diocesan website reports. The church will be built in the territory of the future medical cluster, the construction of which started in March. The doctor of Nicholas II family voluntarily followed the royal family in exile to Tobolsk and then to Yekaterinburg, where he was martyred together with them at night from July 16 to 17 1918. The Bishops’ Council decided to canonize Botkin in February 2016. He was canonized on February 7, 2016, on the Feast of New Martyrs and Passion-Bearers of Russia in Yekaterinburg Church-on-Blood.